Plays on your mission showing less than 30 points (or on Qo'noS), if unattempted. Nullified if you play (or have played) Scan, Full Planet Scan, or a non-Klingon personnel. 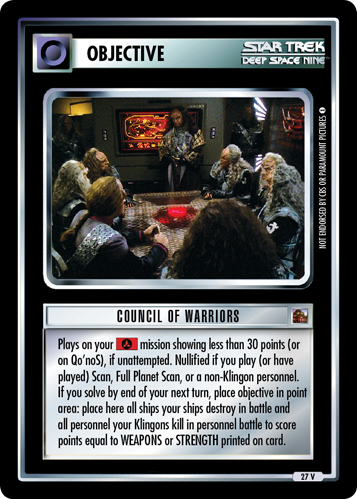 If you solve by end of your next turn, place objective in point area; place here all ships your ships destroy in battle and all personnel your Klingons kill in personnel battle to score points equal to WEAPONS or STRENGTH printed on card. Image Source: Deep Space Nine: "Tacking Into the Wind"